Hercules XPS Lounge 2.1 review | What Hi-Fi? Hercules iPod speaker systems don't typically fit the dictionary definition of Herculean: ‘having enormous strength or size'. Yes, this system is relatively large, but where it really comes into its own is in the fact that its price-tag is anything but Herculean. 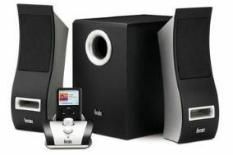 And, no, that's no typo – this really is an iPod dock with two pleasingly fashioned speakers and a subwoofer for just forty quid. If there was an ancient god of great-value budget products, we'd like to think this system would be named after him instead. The XPS Lounge 2.1 is attractively designed: the stereo speakers have an attractive curve that'll look good on your desktop. It's all easy as pie to get up and running, and when you do, the big surprise is how good it sounds for the cash. We were expecting a treble sound fashioned from broken glass and killer wasps, but were surprised when we heard a top end that's fairly solid, smooth and mellow. The little subwoofer backs things up with a deep thump. It's not the most accurate or well-integrated bass in the world, but for £40 quid, it's actually rather good. Of course, there's a (strong) argument that to get a decent performance you should simply spend more than this. And the obvious flaws here – lack of detail, realism and integration – lose the Lounge a star, even at this price. However, we do admire this system for what it achieves at the price. If you're after an iPod speaker system, and you really want to spend as little as possible, give it an audition.